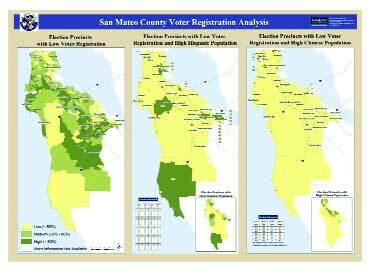 Agency: San Mateo County, Calif.
San Mateo County's office of elections knew that a significant number of minorities in its 550 precincts were not registered to vote. The county wanted to improve registration and turnout among those voters through use of its geographic information systems. Although the county had extensive experience with geographic information systems, the voter outreach program faced a unique challenge, because the county's precinct data did not correlate with census data. Using the combined GIS data, election officials have been able to go into communities with appropriately bi-lingual staff and materials. After the election, the system will help analyze how the project worked and how it can be improved next time. San Mateo County called Farallon Geographics, which had merged the county's GIS projects into one database. Using ESRI's ArcGIS software, Farallon merged precinct and census data into a single system that could identity low voter registration by ethnic group. Farallon's digital maps help San Mateo County target voters. Geographic information systems are more prevalent in government than one might think. "Everyone who's going to buy a GIS system already has one," said David Sonnen, senior consultant for spatial information management at research company IDC Corp. The market for GIS software, maintenance and support has flattened out, settling in at $1.6 billion in 2003, he said. This market saturation, although not necessarily good news for GIS vendors, presents numerous opportunities for integrators. Federal, state and local governments often have discrete GIS groups working on task-specific GIS initiatives. But as geospatial data becomes increasingly important to all types of agencies, integrators are called on to marry disparate GIS projects and build applications that take advantage of unified geospatial information. "GIS folks are trying to use their technology and make it available to other enterprise processes," Sonnen said. San Mateo County, Calif., just south of San Francisco, is considered a proficient user of GIS. Until recently, the county's departments each pursued its own GIS projects. This year, the elections office wanted in on the action. The county knew there were communities that were underrepresented at the polls, but didn't know where to find them, said Carol Marks, director of communications and special programs. With the right intelligence, her group could better target voter drives and education campaigns using the right people and resources, she said. "We had a county GIS system and our own voter registration data," Marks said. "We wanted a way to merge our data with census data to identify precincts on a map with high densities of Hispanic and Chinese populations but low voter registration." Farallon Geographics Inc., a small San Francisco systems integrator, was intimate with San Mateo County's GIS operations. In 2002, the company completed a multiyear project to take the county's GIS databases and merge them into a single enterprise system accessible through Web applications. The company chose Oracle Spatial software for the new GIS database. "The big database companies like IBM and Oracle are adding the ability to handle spatial data natively," IDC's Sonnen said. With a central repository of GIS data, San Mateo County was able to eliminate redundant work and make the information usable by a wider variety of government offices. "Since then we've been building purpose-based applications," said Dennis Wuthrich, chief executive officer of Farallon. For the elections office solution, Farallon had to combine distinct geospatial data into a single system. There are roughly 550 voter precincts in the county, but more than 7,000 census tracts, and they don't fit nicely together. Mapping one data set against the other required specialized GIS tools. Farallon used ArcGIS Desktop from Redlands, Calif.-based ESRI. ArcGIS is a suite of software for creating, analyzing and managing geographic data. It's used throughout federal, state and local agencies, including other elections offices such as the one in Maricopa County, Ariz., the nation's fourth most populous county. With ArcGIS, Farallon developers were able to calculate the intersection of precinct and census data, break it down and redistribute it throughout the county's precinct maps. The result was an interactive system that displayed voter turnout by ethnic group. "It takes all the guesswork out it," Marks said. "We can deploy resources where they're most needed. We can have people doing canvassing and voter registration with appropriate language materials, and we can hire the right people, who are bilingual, to do community outreach." Warren Slocum, the county's chief elections officer, said San Mateo's GIS outreach program is among the first of its kind. "The accuracy and speed that GIS technology lends to the process is overwhelming," he said. Farallon does GIS work for a variety of government agencies, from the California Highway Patrol to the Bureau of Indian Affairs. In San Mateo County, the company is now working on a project to integrate GIS data with a FileNet document management system so the county recorder can pull up all the documents related to a particular property using a digital map. "Agencies have been using GIS for a long time, but it's usually in isolation," Wuthrich said. "The concept of a centralized repository is a relatively new thought." IDC's Sonnen said that although the market for GIS tools is flat, opportunities for integrators to build services that exploit geographic data are growing. "Integrators probably do 2.5 times the business that the software people do," he said. "By spreading GIS information out across other information systems, they make those systems more useful."